The South Texas Project Electric Generating Stating (STPEGS) site is located on 12,220 acres along the west bank of the Colorado River in Matagorda County, Texas. The site is approximately 15 miles southwest of Bay City, Texas and is owned by NRG Energy, Inc., Austin Energy, and CPS Energy. The facility consists of two electric generating units, which share a closed cycle recirculating cooling reservoir for heat dissipation. The Main Cooling Reservoir (MCR) associated with the STPEGS is a 7,000-acre off-channel reservoir which is capable of containing 202,600 acre-feet of cooling water at its maximum operating level. Construction was completed in 1979 and initial filling started July 1, 1983. The MCR covers an area of approximately 3 miles by 4 miles and is formed by an embankment approximately 12.4 miles long. The embankment is 40 to 50 feet above the ground surface elevation. Erosion protection of the interior slope is a 2.5 foot thick layer of soil-cement. Grass is used for erosion protection on the exterior embankment slope. A system of some 770 relief wells have been installed in the embankment to relieve excess hydro-static pressure. Make-up water is withdrawn intermittently from the Colorado River adjacent to the site to replace losses due to evaporation. The only other source of water is direct rainfall which averages 24,500 acre-feet per year. Within the MCR are installed dikes that channel the water flow to maximize circulation time for heat dissipation before the water is recirculated back to the generating units. The MCR is also equipped with a gated spillway for emergency use. In December 1971 several public and private groups initiated a feasibility study to construct a jointly-owned nuclear power plant. The current site in Matagorda County and participation in construction was approved by voters in 1973. After several years of preparation, initial construction was halted following the Three Mile Island incident, in Dauphin County, Pennsylvania which took place on March 29, 1979. 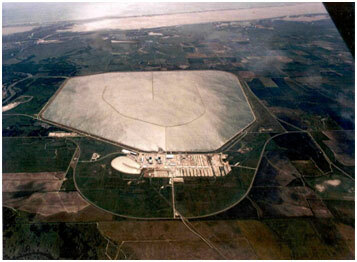 Construction was completed in 1983, with the plant commencing operations in the late 1980s.